2016 was the 18th year since the ECCT held its first annual round table lunch with the Taipei City Government (TCG). As in previous years, the event provided an exclusive opportunity for ECCT members to discuss issues of concern or mutual interest with Mayor Ko Wen-je, Deputy Mayor Charles Lin and a full delegation of senior TCG cabinet officials, who were in attendance. The lunch featured opening remarks by ECCT Chairman Bernd Barkey and Mayor Ko, which was followed by a presentation on the forthcoming 2017 Universiade (university Olympiad or games). After the presentation Mayor Ko and Deputy Mayor Lin answered questions from the audience in a Q&A session moderated by the ECCT's Better Living committee Co-chair, Tim Berge. In his remarks at the lunch Mayor Ko said that the TCG has two simple goals: to be accountable and make Taipei a better and easier place to live. In this regard he welcomed suggestions from ECCT members on what can be done to improve life in the city. The mayor also announced his intention to set up a single contact window to receive and address ECCT issues. The 2017 Olympiade will be held for the 19th time in Taiwan from 19-30 August 2017. 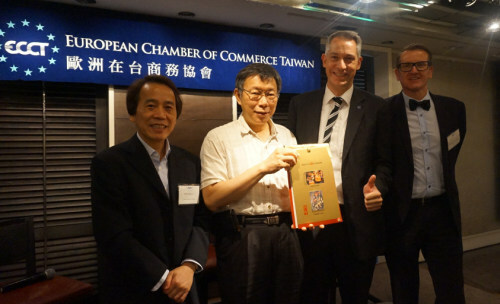 Taipei will join a distinguished list of former hosts including Rome, Tokyo and Budapest. Over 10,000 athletes from universities in 150 cities are expected to participate in 22 types of sports. Two new venues have been constructed from scratch while another 76 have been refurbished for the purpose of the games. While most of the venues are in Taipei City, some events will be held in New Taipei and Hsinchu. 100 international media groups are expected to cover the games. Businesses are invited to become sponsors and offer services. In the Q&A session, Mayor Ko agreed that the city needs to do more to make Taipei more international. For example, some travel-related mobile applications are available only in Chinese and should have English versions. On the subject of motorcycles on pavements and cars not giving way to pedestrians, the mayor noted that the situation has already improved in recent years but that more could be done, such as tightening regulations and stepping up enforcement. On the subject of the proposed U-car (car sharing scheme), the deputy mayor said that it would not be difficult to introduce such a scheme not only in Taipei city but also in other cities by setting aside space in public parking lots. Lin said that he had already identified 100 areas which could accommodate 1,000 parking bays for U-cars in the initial phase, which the city would lease to a car-sharing operator. This could be increased to 10,000 vehicles in the future. Based on successful car sharing schemes in other cities, Lin said that U-cars would be electric and easy to rent and use using a smart phone application. Car sharing is ideal for a crowded city like Taipei since one U-car could replace up to 10 infrequently used cars. It would also give international visitors a useful travel option and young people or those who cannot afford to buy cars an affordable option for part-time car use. While the plan does not yet have the backing of the Taipei city council, Lin said that he would keep promoting the idea.